Anyone is welcome to participate. 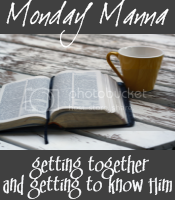 Just put a link to your Monday Manna blog entry in the MckLinky gadget below, and check out others' thoughts. OH - and with the holiday - PLEASE to not be shy about posting late - Tuesday DEFINITELY works for me! This week's verse is quite a comfort to me, and a wonderful reminder during times of uncertainly such as this. Looking forward to seeing YOUR thoughts on this verse - just link up below if you have something to share. My reflections are below. There are some pretty distraught and frustrated parents and new college students in the state of Michigan right now. You see, the state made each of them a promise, and chances are good that promise is going to be broken. The program, not surprisingly called "The Michigan Promise," awarded college scholarships of up to $4000 for students who did well on the state's standardized test (MEAP) in middle and high school. Except that money may not be forthcoming after all. I don't know about the rest of you, but those of us in the great state of Michigan are still in the midst of an economic downturn. And our state government is currently staring at a $2.7 billion budget deficit. So the congress and governor are seriously considering either reducing or eliminating the payouts for this school year. It's understandable to some--unforgivable to others. But no matter what you may feel about this, one thing is clear. This very well may be a promise broken. Of course, it's not just the state of Michigan that doesn't keep its promises. We all have to (or choose to) go back on our word in one circumstance or another. Sometimes our circumstances change. On occasion, it's our priorities. And sometimes, we take the promises we make too lightly and just blow them off. And it almost always leads to disappointment and disillusionment. That's one reason I love God's promises. When life is up in the air and vows are being rescinded left and right, it is wonderful to know that there is One who will always keep His Word. There is no one you can depend on like our Savior. And that's a promise you can take to the bank! Thanks, Joanne. I really needed this verse today. What a beautiful reminder of how steadfast and faithful our Lord is. I love this scripture reference. Our God is faithful and WILL keep all HIS promises! He shows me this everyday, regardless what our financial situation, or my husbands health looks like. I don't think I properly linked with your blog, but I meant to. I'll try to figure out what I did wrong, and do better next week. Thank you. This was good. Yes, it's great to be able to rest in His faithfulness. As He has cared for us in the past, we can trust Him with the future. Bob - since your profile is private, this is the only way I could figure to contact you. Assuming your blog is private too - if so, I don't think there's a way to link up that will allow folks to read it, unless we each have permission to access your blog. Funny, we "believe" the verse until some situation comes along and somehow there niggles in the back of our minds the thought that God might not be able to keep his promises this one time. I guess that's because we've been hanging around people too long (politicians definitely included). Great post, Joanne. Love this verse. It's a continual reminder to me that all may fall away, but He stands firm and unchanging. This theme of God's promises keeps coming back around to me at every angle. I think it is an area I need to grow in... reminding myself that God's Word is true and that he makes good on every promise he's made. Even when I cannot see his hand at work, he's working to bring about a good and perfect completion to my faith. Thanks for this; sorry I didn't post. I just haven't been able to do much with my words as of late.